In modern board gaming, we tend to have a short memory and a long wishlist. Seven of the top ten games on Board Game Geek were published after 2010. Kickstarter has us shelling out funds many months (sometimes years) before games are released, and by the time they land on our doorstep, we’ve already moved on to the next thing. Reviewing Mogul as part of the Dusty Dragon series might be cheating a little. After all, the edition I’m reviewing was released in 2015. But the new edition of Mogul, while including some novelties, is a reprint of Michael Schacht’s 2002 release of the same name. Since the game was never available in English before this new printing, and since it retains the game’s classic feel, and since Rio Grande Games has done very little to market their new edition (making it seem older than it is), I’m comfortable placing it in the Dusty Dragon series. With that bit of housekeeping out of the way, let’s take a look at the game. Mogul is a bidding, network-building, and stock manipulation game for three to five players. Players bid for shares of stock and for the option to sell or build on their rail networks. The player with the most points when the stock market crashes wins. To begin, each player receives shares of stock according to the setup cards included in the game, and the stock market crash card is shuffled into three random shares and placed on the bottom of the stock certificates deck. Each player receives six bidding chips and all the depots in one color (one of which is placed at zero on the score track). The wooden bowl is placed in a central location. 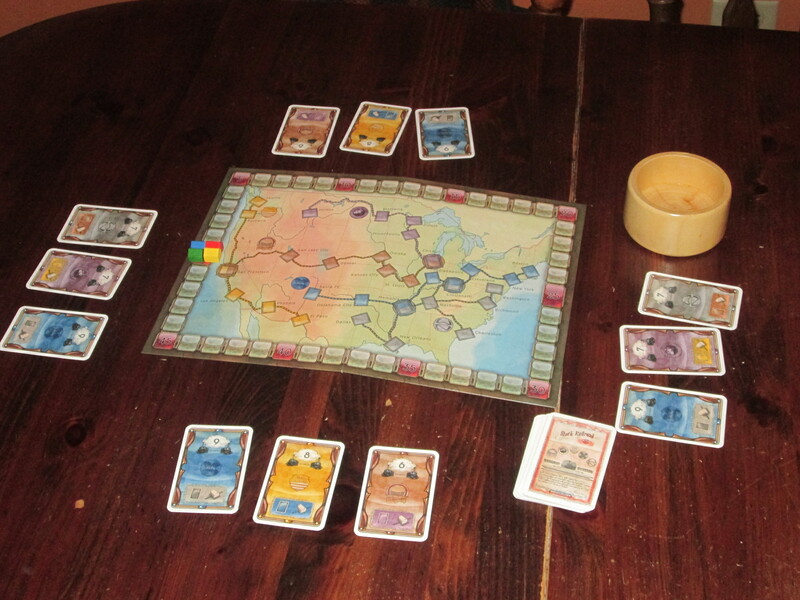 Mogul set up for four players. Each stock certificate in Mogul has three pieces of information: a stock color (one of five), a number (indicating how many shares are in the deck), and a color-coded action, which allows a player to either sell stocks of that color or place a depot anywhere on the rail line of that color. Mogul is played in rounds. 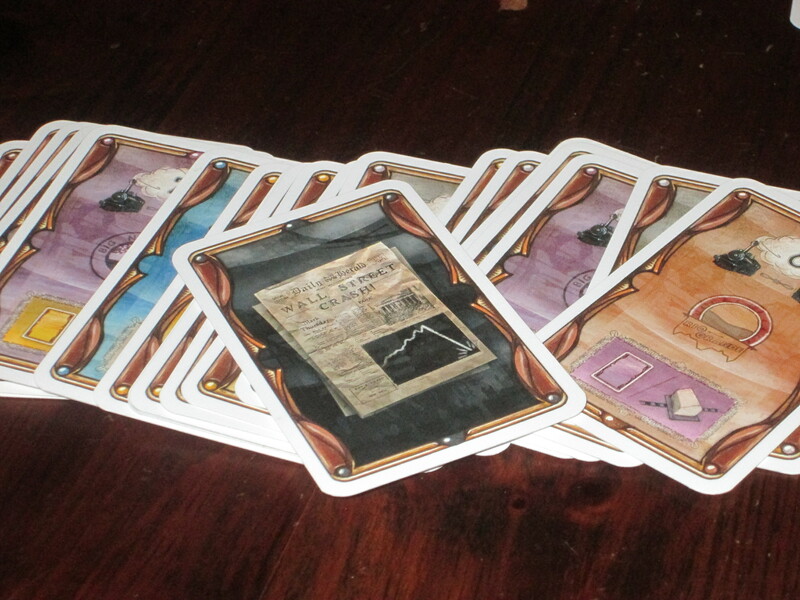 At the start of each round, the player who took possession of the last share of stock turns over the next card. Each player who owns stock of that color earns one point for each share of stock of that color. Then players bid. Beginning with the player who turned over the share of stock, each player may either throw a chip in the bowl to stay in the round or pass, taking all the chips in the bowl. When all players have passed but one, the player who didn’t pass may choose to either keep the stock certificate, adding it to his or her portfolio, or execute the action, either placing a depot or selling stock of that color. The last player to pass gets the option the winning player didn’t select. Mogul comes with reference cards to help players remember how to set the game up. When a player sells stocks, he or she must sell all stocks of that color at once. Stocks are worth 1 point for each stock of that color among all the players, so stock generally devalues as the game progresses. 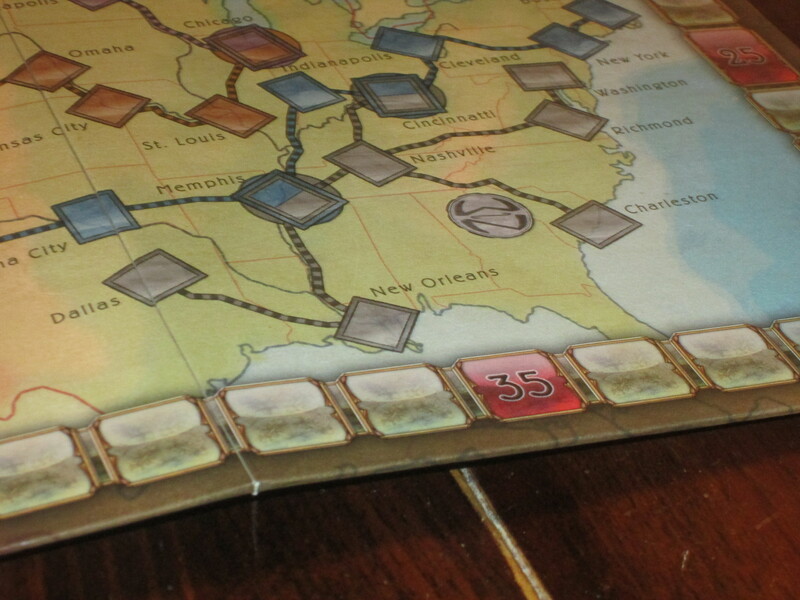 Depots score points at the end of the game equal to the number of depots on a rail line squared. When the stock market crash card is turned up from the stock deck, the game ends immediately. Players add 1 point to their score for every five chips they have and for each share of unsold stock they own. 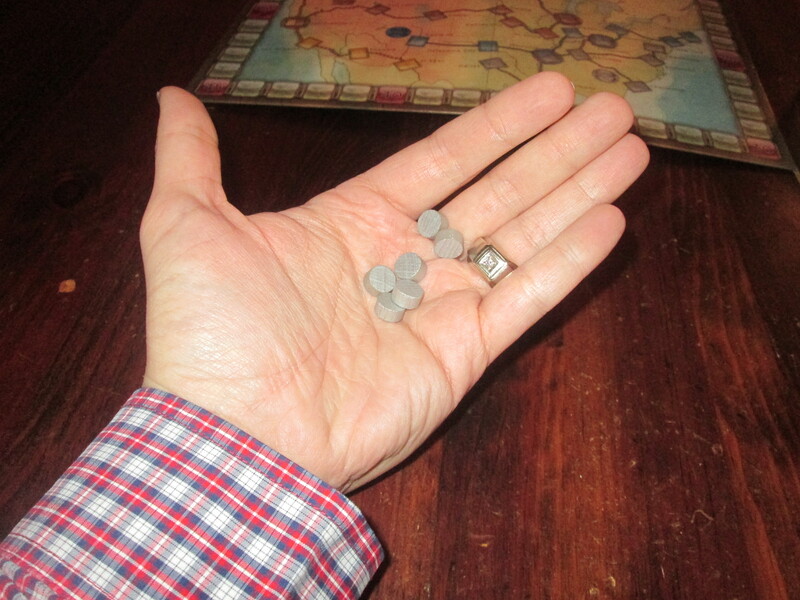 They score their depots, and the player with the most points wins. Yes Please, or No Thanks? No Thanks! is often given credit for introducing the “pay to play” auction, but Mogul did it first. It just wasn’t released in English, and No Thanks! has become a filler staple in the meantime. The No Thanks!-style auction (even I can’t keep from calling it that) has always intrigued me, but I’ve found No Thanks! itself a little lacking. Sure, it’s good for some tension and laughs, but it feels, if not incomplete, just a little too simple, even for a filler. I tried Lascaux, which also uses the No Thanks!-style auction, but the graphic design of the cards made it nearly impossible to play. So I waited and waited and waited for Rio Grande Games to release their Mogul reprint. Now that it’s here, what do I think? I think it was mostly worth the wait. The wooden bowl for chips is the star component here. It’s not entirely necessary, but it gives physicality and gravity to the bidding decision. This is a wonderful addition. 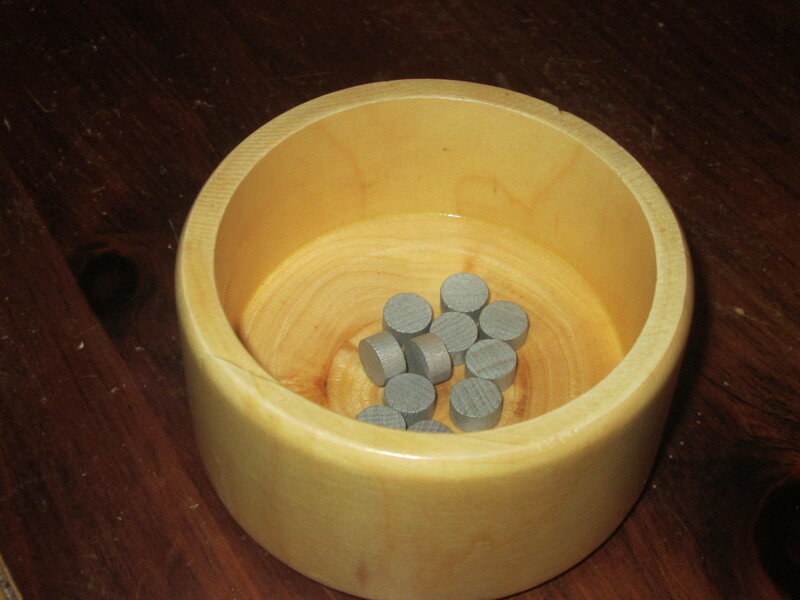 Mogul does so many things right, but the first and most notable detail is the wooden bowl included in the game. Yes, its opaque exterior does make it difficult to see how many chips are in the bowl unless you pass it, but the big bowl makes it clear from the beginning just how central the chip auction is. More than that, when you drop a chip in the bowl, it makes a gratifying clack, reinforcing your resolve to stay in the auction. Of course, it’s also so tempting to look inside and see a lake of chips that could be yours if you just…bow…out. The bowl could have been anything–it could have been a coaster where players place their chips, or a card, or a plastic cup. The wooden bowl adds weight and substance to the game, a physicality that would otherwise be missed. Every player I’ve introduced to Mogul has commented on the bowl, and we all agree that the game would in some way be diminished if it were absent. So kudos to Rio Grande Games for including it. The simple binary of bid or pass makes the game tick without becoming overwhelming. It’s super easy to teach, and players generally understand what they have to do, even if they don’t know the best way to do it. Players have to balance getting what they need as well as getting the currency they need to participate in future auctions. The chips matter during the game, but at the end of the game, players won’t earn many points with them. So players are rewarded for using their chips wisely during play. There is a strong temptation just to win bids, but players will do better if they wait for the opportune moment. Similarly, there can be a strong temptation to take a bowl full of chips and bow out of the bidding, but it can be worth strapping yourself on future auctions to exert yourself where you need to. The crash card is shuffled with three random stock cards to form the bottom of the deck. As the deck is depleted, players feel the tension that the game could end at any moment. The main draw of Mogul is its tension. Every turn players are bidding for one of two things–a stock certificate or an action. At the start of the game, it may not matter much which option you end up with if you win an auction, so just being in the final two matters. But as the game progresses, players will have their eye on one thing or the other, and that’s when bidding gets especially tense. I love this, because the tension naturally increases as the game goes on. As I understand it, the first edition of Mogul had no board, and so the action portion of each card was simply to sell stocks. This seems like it would have been weak at the beginning of the game and very powerful toward the end. 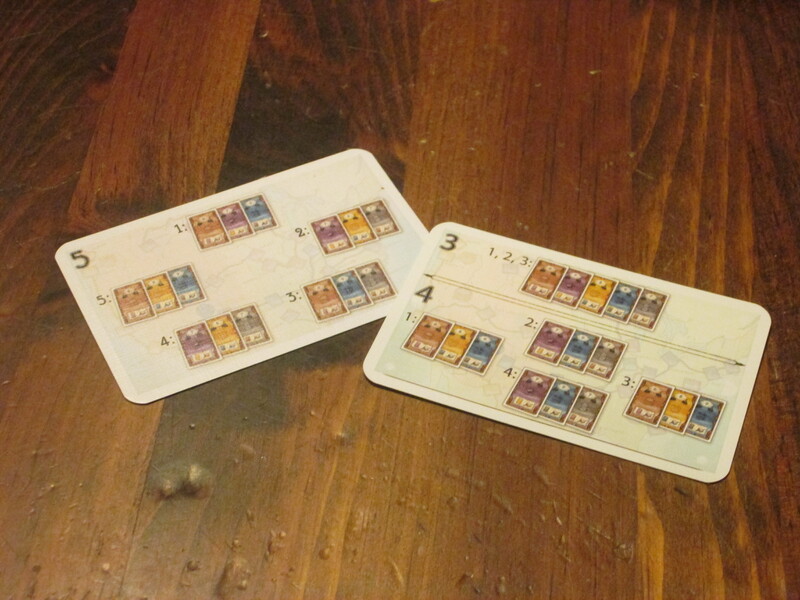 The new edition of Mogul introduces a second action that can be taken with each card: building a depot. 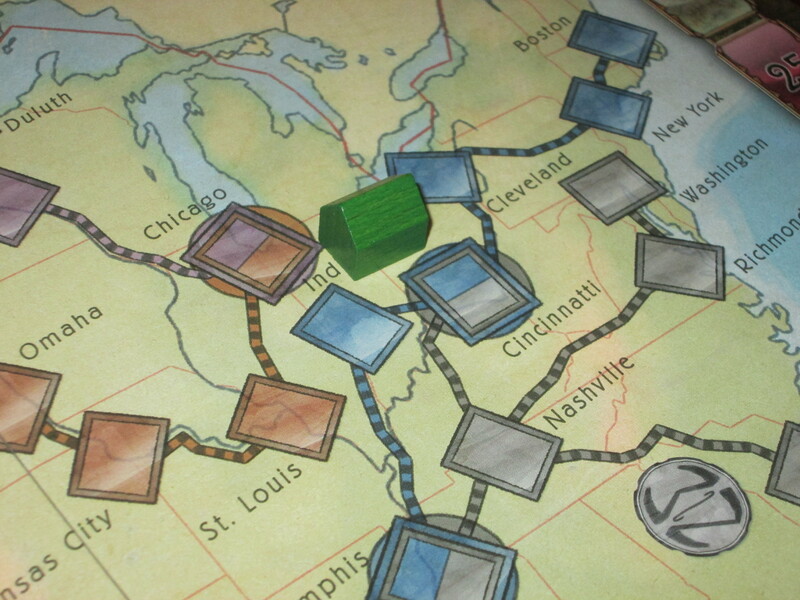 While building one depot is about the same as the option to sell stocks at the start of the game, the more depots a player builds, the more points they will be worth at the end of the game. Also, there is some incentive to building depots early, as each train line on the board has at least one depot spot that is part of two lines, scoring for both in the endgame. I like this change as it increases the tension at the beginning of the game (albeit slightly) by making the action portion of each card more desirable and it increases competition for the action portion of the card in the late game. This version has also changed the color distribution of actions on stock. Now each color of stock always corresponds to a single color of action, so it’s easy to track how many opportunities you have left to sell stock or place a depot, which heightens the tension in the game through anticipation. 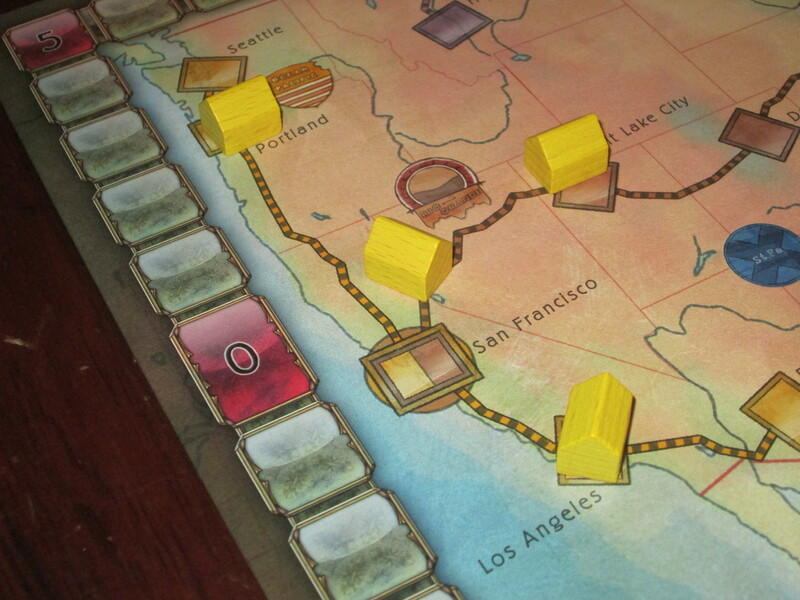 Depots are only worth it if you get multiple on the board of the same color, but in order to secure the best spots, you have to win bids early. Timing and tension: that’s what Mogul is all about. Mogul is all about timing. If you don’t want what’s in the auction, you can keep paying chips to stay in, hoping that you’ll get a big payoff when you pass. But if you wait too long, someone is likely to crack under the pressure of seeing so many chips in the bowl and take those chips from you. Stocks are worth more points the more that are on the table, so you want to sell stocks at the most opportune time. But you also don’t want to miss out on recurring points when stocks of that color are turned up from the deck, and you don’t want to go bankrupt in the auction to put yourself out of the running for other cards you need. And you certainly don’t want to miss your opportunity to sell altogether. You want to win the right auctions, and you can closely monitor how many of each card remain in the deck, but the stock market crash appears semi-randomly. You know it’s in the last four cards, but it could be anywhere in that mix. All of this timing reinforces the tension that Mogul has on offer. Because of this high tension and the importance of timing, Mogul does a great job of keeping all players invested until the end. A depot scoring example. This player would score 9 points for depots on the yellow line and 4 points for the brown line. Those two-color spots are worth getting. I think Mogul is great, but there are two things about it I’m less keen on. The first is how long it takes to play. Mogul still fits comfortably in a lunch hour (including an explanation of the rules and even when playing with five players), but the interest of the core mechanism seems better suited toward a shorter game. That is, the tension of staying in the round or passing to get chips is fascinating, but the game lasts a little longer than I want it to because the decisions are similar from round to round. The length isn’t enough to put me off from playing–I still enjoy the game quite a bit–but it is enough to keep it from being a game I break out all the time. If Mogul lasted even thirty minutes, I could see it getting played much more than it does (which is still a fair amount). As it is, it’s a fun, challenging, and engaging game, but when I finish playing, I’m satisfied for a while before pulling it out again. It might be a good time to sell yellow. Each stock is worth one point for each stock of that color on the table. If these were the only yellow stocks, selling would be worth 9 points. The other thing I’m less keen on is the great variability from game to game dictated by player count. In a three-player game, only one player is left out of getting something in each round, so the stakes are lower and there is less tension. The five-player game, by contrast, is almost too tense. It can be incredibly difficult to manage your bidding chips because the bidding might not come back to you with a full bowl, and since only two players earn something in a given round, there is a lot of “gathering strength” (my euphemism for passing), which doesn’t seem as interesting as winning stuff. I’d rather play the tense five-player game than a game with three players, but I think the sweet spot here is four. Still, while I’m less keen on this, I’d play with any number, and the variation in gameplay based on player counts is probably more a feature than a bug. Once you’re aware of the heightened tension in a five-player game, it’s not too bad, and compelling five-player lunch-hour choices aren’t as prevalent as I’d like. Mogul fits the bill nicely. The chips in Mogul are tiny, but they are easy to conceal in the hand. 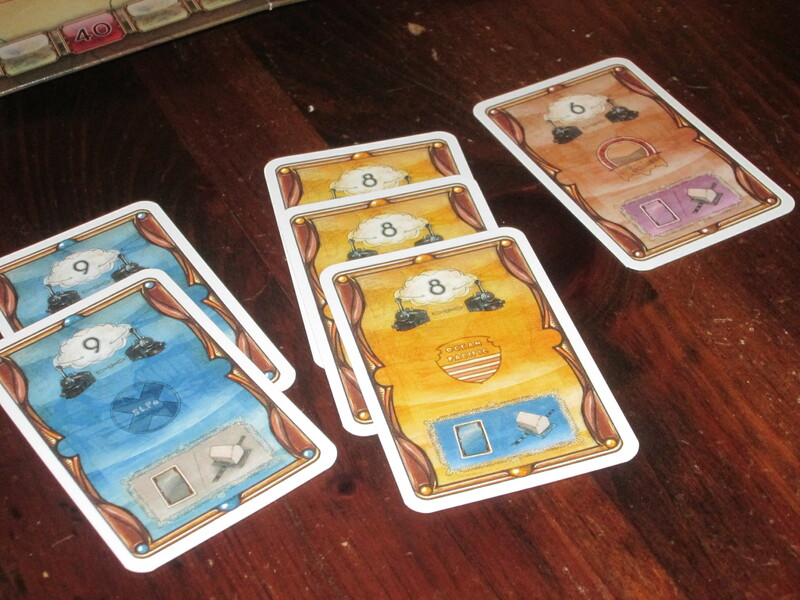 The components in Mogul are nice–the cards have linen finish, the depots are of good quality, and I’ve already talked about the bowl–but the art is a little bland. 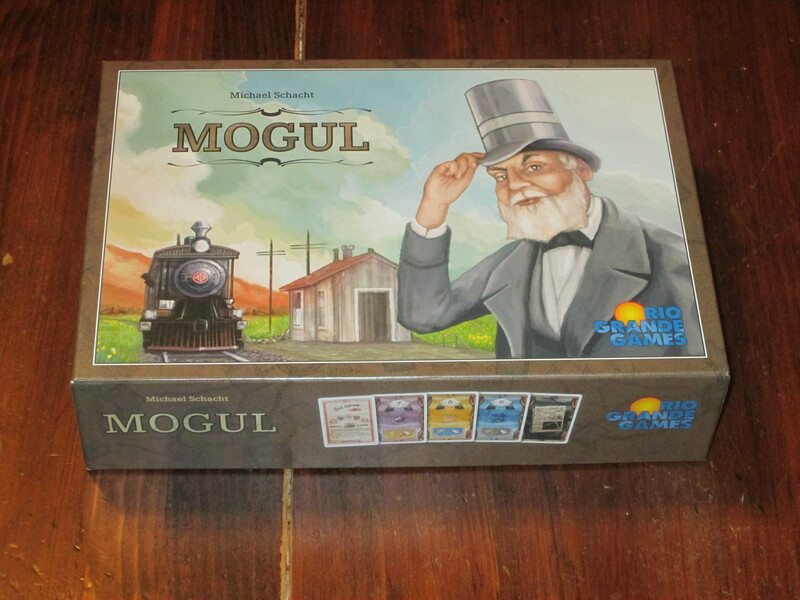 I don’t think anyone is buying Mogul based on the cover or the board art. My board also doesn’t lay completely flat, but it isn’t used for much, so this isn’t a huge deal. The chips are a little on the small side, but this makes sense for gameplay reasons (you’re allowed to hide your chips from other players). I might be a little disappointed in the package if I paid the $35 MSRP, but the gameplay is definitely worth online prices. The map is a little drab, and it doesn’t lay flat on the table. Also, they spelled “Cincinnati” wrong. Mogul is a great game, one that has become a somewhat frequent favorite around the lunch table. It’s fast (although, as I noted above, not really filler length), it’s tense, and it provides a lot of good interaction as you try to guess what the other players will do and just how much they want what they’re bidding on. Mogul illustrates what makes Michael Schacht such a great designer: a game with simple rules that introduces lots of great tension and space for player decisions. Mogul won’t be for everyone, but it most definitely is for me.